It is just a few weeks since I was standing with Team USA in closing ceremonies at the FCI Agility World Championships. The arena was packed with teams and FCI delegates. What is normally an exciting and uplifting ceremony was for me extremely sad. We watched the FCI flag be passed from the Czech Republic back to the FCI and subsequently be passed in a traditional ritual to next years’ hosts of the Agility World Championships. At this point in the event we are usually very excited in anticipation of the discovery process about the next country we hope to visit, wondering what the host city and environment will be like, and curious about the judges we will study for the next year. The passing of the flag to the South African representative was emotional for me and I assume was for many others as well. For 17 years I have heard discussions about holding the event off the continent. I heard it from our first agility director who always hoped the USA could host the event at some point, and I have always been opposed to the idea. I am a realist. I know that many if not most of the European handlers would not be able to afford the trip to the USA, just like they will struggle to go to South Africa. Without a strong and large European contingent of handlers the event would not be what it is, the most competitive international agility event in the world. It is not that I WANT to trek to Europe every year, but I DO want to go where the largest number of countries and handlers are able to participate. The trip to SA is a long, grueling and expensive trip for dogs and humans, and for some of the countries it is unreachable. It is unreachable not because of the global disadvantage and the cost, but because quarantine laws exist in South Africa and 9 of this years’ participating countries would need to quarantine their dogs for two weeks on arrival in that country. Since returning from the 2012 Agility World Championships in the Czech Republic we have discovered the reality of which countries are actually eligible to travel to South Africa for the Agility World Championships 2013 without going through a 2 week Quarantine process. There are only 45 countries in the entire world that are eligible to enter South Africa without quarantine. Of those 45 countries only about 27 of them actively participate in the Agility World Championships. This year many of the teams that were at the 2012 AWC will either need to go through quarantine or skip the 2013 AWC. Those countries are Belarus, Brazil, Chile, China, Columbia, Croatia, Japan, Mexico, Russia, and San Marino. There are some agility power-houses on that list, as well as countries that only sent one competitor like San Marino and Mexico. There are at last count approximately 195 countries in the world, and less than 30 active agility countries qualify to travel freely to South Africa. The South African World Championships excludes the real possibility of participation for the majority of the world and many of our friends. It is of course doubtful any handler would be willing to put their dog through the torture of quarantine and unless the requirements are lifted, those countries will obviously not attend. Japan is one of those countries. They have already informed organizers that they will stay home. The South African agility organizers are working to have the quarantine lifted, maybe it will happen. But many countries have already begun the qualification and competition process to win a place on a team for 2013, so even if quarantine rules are lifted for some countries, it may be too late to prepare to attend the event. In hindsight of course it would have been a good idea to have that kind of South African governmental assistance guaranteed before applying to hold the competition. Most European handlers are totally unaware of what kind of extreme difficulty and expense it is to travel overseas with a dog. It is something Americans must do in order to be able to participate, but not one we take lightly and not without great difficulty in preparation. It is of course financially challenging, and the paperwork seems like a nightmare at times, but more importantly, there is a risk of your dog’s health. There are many who would never hand their dogs to a cargo department of an airline for a 20 hour ride in a box, but that is just what will need to happen in order to travel to South Africa. A 15 hour flight from the USA to Johannesburg translates to a dog being handed to a cargo department 2 or 3 hours prior, and possibly collecting the dog up to a couple hours after landing and vet checks. That could easily turn a trip into 20 plus hours. This is a very personal decision each handler will need to make with their dogs only after doing all the special research into viability and safety. Dogs traveling to South Africa must undergo 5 special blood tests in the months before departing for the country, and most dogs will also need rabies titer testing in order to come back to their home country after visiting South Africa. In the USA those blood tests cost approximately $500. The estimates for dog shipping are $2000 to 3000, and even the small and medium dogs that usually travel safely in cabin with their handlers must travel via cargo as South Africa travel requirements do not allow small dogs as excess baggage. It is still unclear if this also might be waived, the fees certainly won’t be waived, but the cabin travel might be a slight possibility. Pair the fees of thousands of dollars for dog shipping, passenger travel, & hotels, and the event costs add up to an astronomical amount. The event is a year away but most countries need to make decisions NOW on whether to have their tryouts events, whether they can afford to send a team, if anyone is willing to personally pay the funds to go, and many more unanswered questions. The organizers are asking which countries are coming and the countries are asking to know ahead of time about the costs. If more agility handlers and their country’s delegates had known of the quarantine restrictions in advance would the outcome be different? Does it really make sense to have the event in a location where so few countries in the world are free from quarantine restrictions? Is it possible that many of the supporters of the Agility World Championships being held in South Africa were uninformed and made decisions without hard facts and specific details? For at least few years we have known that the event was scheduled for South Africa, it is just that none of us believed it would really happen. Throughout the month prior to the 2012 Championships I looked forward with trepidation to the final announcement of the locale of AWC 2013. My thoughts were that I would feel sorry for the South African organizers that have gone through so much effort to bring the event to their country if the FCI decided to take it from them. At the same time that is just what I hoped would happen; that the organization would really take into consideration all the problems involved and that South Africa would gracefully withdraw. Since 1996 I have made 16 trips across the Atlantic to the Agility World Championships and 5 to the European Open. 11 of those trips I traveled with my own competition dog. I understand way too well many of the difficulties that the teams face in preparing to attend the event in South Africa, but as complicated as it is to travel to Europe from North or South America or the far east, it will be that and much more to prepare for a trip with a dog to South Africa. As much as I would love to have a holiday in the beautiful city of Johannesburg on the exotic continent of Africa, I do not relish the effort it would be to travel with a team of dogs to that continent and that country. I truly don’t believe anything will stop the Agility World Championships now from being held in South Africa. I fervently hope that in the future much greater consideration is given to where the event is held so that it is at least reachable by a majority of the World’s agility handlers and dogs. Yes, we do want the event to be a WORLD Championship, and I hope that it can eventually be held at times out of Central Europe, but there are other countries around the world that would have been willing to host that do not have such stringent quarantine laws, and that are more easily accessible to more of the worlds’ agility handlers. Early in 1996 I received a call Sharon Anderson the AKC Agility Director. 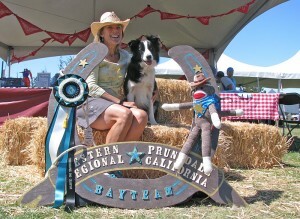 She invited me to be on the AKC/FCI Agility World team with my border collie Scud. I said “YES!” on the spot, and 17 years later AKC Agility and participating in the FCI Agility World Championships, and the FCI European Open as well as local and Nationals events is a huge part of my life each year. I was on the AKC/USA team for 4 years with Scud, finishing 6th in 1999 in Dortmund. In 2000 I took a year off of competing, but still traveled with the team as a supporter. My border collie Riot made the team the next three years (2001, 2, 3) and we had some spectacular runs and I have many incredible memories. Riot and I won the Individual Agility class in 2002 at the Agility World Championships, and were second in 2001. In 2005 I assisted AKC /USA Coach Dan Dege, and in 2006 I took over as head coach. This year, 2012, was my 7th year coaching the team. In 17 years I only missed traveling with the team one time (2003). For 5 of the last 6 years I have also traveled to the European Open and competed with my border collie Ace. That is 22 European trips and lots of familiarity with overseas dog travel for both myself and my dogs. Welcome to the new Power Paws website! It has been many months in the building and will be months more before I have put in all the content I hope to have here in our new web home. I like the new clean look though I can’t promise I won’t tinker more with colors and art and the overall look as time goes by. A while back I decided I did not want to make any more blog posts to my old word press page, thinking of course that I was only weeks away from completion of this new abode, now I have no excuse for not sharing all the stories and thoughts that have been lurking around in my brain. I usually think about subjects for articles or a blog post, or projects in the works while I am walking my dogs each day. The last walk of the day is usually just before dusk, the sun is getting ready to set and the dogs are full of themselves after lazing around all afternoon. I am usually quiet and thoughtful while the dogs tear around the fields, but after seeing a mountain lion on a recent evening stroll, I have started to announce my presence on some of the trails. I am my own personal “bear bell” now while on the tree lined path through the ravine. The dogs like my new noisy enthusiasm, though it doesn’t do much for my thoughtful evening stroll mentality. I am often thinking about Scoop and what our next training goal is and what my next few days of training should focus on with him. I am still thinking in cowboy mode after the recent Bay Team Western Regional where our team of Ace, Sweep and Switch won the Team Tournament. Husband Jim was running Sweep and Geri Hernandez was running her barely two year old mini poodle Switch who never put a foot wrong in every team class! The event was great if I do say so myself, and I do since I was the trial chair:) Ace won the local Steeplechase Round one and the Regional GP round 1, and did some other great stuff too. Scoop’ was on a training team with his dog sister Motive and our team of Scoop/Motive/Bounce managed to qualify and finish in 13th place out of 42 teams! The photo is of Ace in the cool piece of art that was created just for this event. We all had lots of fun taking photos on the western “set”. I hope you will come back and visit the new site again soon, I promise to have more for you to read and watch and maybe even a bit of shopping too.